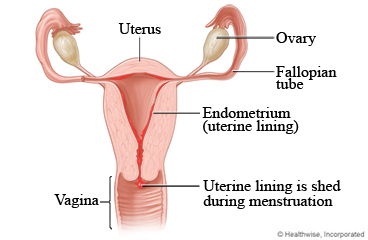 Painful menstrual cramps (called dysmenorrhea) are one of the most common reasons women seek medical attention. Painful periods can cause cramping in the back, thighs, and belly. You may also have diarrhea, constipation, or nausea. Some women get dizzy. Pain medicine and home treatment can help ease your cramps. Take anti-inflammatory medicines to reduce pain. Ibuprofen (Advil, Motrin) and naproxen (Aleve) generally work better than aspirin to ease cramps. Start taking the recommended dose of pain medicine as soon as you start to feel pain or the day before your period starts. Keep taking the medicine for as many days as your cramps last. If anti-inflammatory medicines do not relieve the pain, try acetaminophen (Tylenol). Talk to your doctor or pharmacist before you take any of these medicines. They may not be safe if you are taking other medicines or have other health problems. Put a heating pad (set on low) or a hot water bottle on your belly, or take a warm bath. Heat improves blood flow and may relieve pelvic pain. Lie down and put a pillow under your knees, or lie on your side and bring your knees up to your chest. This will help relieve back pressure. Get at least 2½ hours of exercise a week. This improves blood flow and may decrease pain. Walking is a good choice. You also may want to do other activities, such as running, swimming, cycling, or playing tennis or team sports. Enter Z243 in the search box to learn more about "Painful Menstrual Cramps: Care Instructions".